Zonia Baber (née Mary Arizona) born Kansas, IL August 24, 1862 (d. 1956). Geography professor; feminist; pacifist; anti-racist; anti-imperialist; WILPF member of Balch mission to Haiti 1926 leading to end of US military occupation; promoted Puerto Rican suffrage; mapped world peace monuments. Joan Baez born Staten Island, NY January 9, 1941. Antiwar singer; founded Institute for Nonviolence, 1965. Hannah Johnston Bailey born Cornwall-on-the-Hudson, NY July 5, 1839 (d. 1923). Quaker head of Peace & Arbitration Department of Women's Christian Temperance Union 30 years 1887-1916, the most influential American peace organization of the last quarter of nineteenth century; editor of two peace publications, Pacific Banner and The Acorn 1889-1895; opposed all wars and conscription; suffragist, opposed capital punishment; officer of Universal Peace Union promoting nonviolent resolution of disputes, opposing imperialism; joined Women’s Peace Party opposing World War I, and WILPF. Pearl Mae Bailey born Newport News, VA March 29, 1918 (d. 1992). African-American singer and actress. Named as America's "Ambassador of Love" by Richard Nixon, 1970; appointed special ambassador to the UN by Gerald Ford, 1975. Promoted campaign against AIDS. Eva-Lee Baird born New York, NY April 29, 1940. Grandmother for Peace; art teacher; photographer; arrested 2005 for protest at New York recruiting station; acquitted; Toys-R-us protest 2006; protested Obama wars 2009. Elizabeth Evans Baker born Montclair, NJ February 25, 1902 (d. 1990). Peace advocate; philanthropist. Sponsored peace programs at Juniata College, 1971, and Ohio State University, 1981. Ella Baker born Norfolk, VA December 13, 1903 (d. 1986). Nonviolent human rights activist; founder of Student Nonviolent Coordinating Committee, 1960; Southern Christian Leadership Council, 1957; Director NAACP, 1943-6; protested Ethiopian War, 1936; WILPF. Sara Josephine Baker born Poughkeepsie, NY November 15, 1873 (d. 1945). Physician; first US woman to serve in League of Nations, as representative to Health Committee, 1922-4; pioneer in public health, esp. for immigrants. Emily Greene Balch born Jamaica Plain, MA January 8, 1867 (d. 1961). "Improper Bostonian" awarded Nobel Peace Prize, 1946; founder of WILPF; as economist, proposed the idea of international mandates for colonies. Anna Baltzer born Berkeley, CA August 22, 1979. American Jewish defender of Palestinian rights; International Women’s Peace Service volunteer documented nonviolent resistance 2004. Anaïs Barbeau-Lavalette born Montreal, Canada February 8, 1979. Canadian film producer and actress; human rights advocate. Won Artists for Peace Award for film Inch’Allah on Palestine violence, 2012. Shirley R. Barbour born April 15, 1918 (d. 2005). American artist; World Federalist. Leader in Rhode Island Nuclear Freeze campaign Women for a Non-Nuclear Future; Rhode Island Peace Mission. Judi Bari born Baltimore, MD November 7, 1949 (d. 1997). 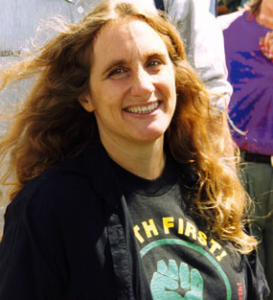 Environmental activist; labor organizer; ecofeminist; leader of Earth First!, 1979; nearly killed by bomb in nonviolent Redwood Summer, 1990. Maude Barlow born Toronto, Canada May 24, 1927. Nonviolent internationalist, co-founded Blue Planet Project 2001; co-founded nonviolent Council of Canadians 1985; won Alternative Nobel Prize 2005; co-founded World Future Council 2004. Laura Clifford Dreyfus-Barney born Cincinnati, OH November 30, 1879 (d. 1974). Baha’i leader. Promoted League of Nations and United Nations. Fluent in Farsi and French. Nurse with American Ambulance Corps, 1914-15, and American Red Cross in France, 1916-18. Representative of International Council of Women at League of Nations and UN; only woman appointed by League Council to Education Committee, 1926. Headed committee to promote peace through film and radio. Active in Institute on World Organization planning for postwar organizations, including UNICEF. Roseanne Barr born Salt Lake City, UT November 3, 1952. Actress; opposed wars in Iraq and Afghanistan; participant in "One Taxpayer's Mother" protest for Code Pink on National Mall, May 8, 2010. Drew Barrymore born Culver City, CA February 22, 1975. American actress, producer, and director. World Food Program Ambassador against Hunger, 2007. Clara Barton born Oxford, MA December 25, 1821 (d. 1912). Pioneering war nurse, providing what she called "war on war itself." Founded American Red Cross, 1881, and extension of relief to peacetime disasters; achieved US signature to Geneva Convention, 1882. Daisy Bates (née Gatson) born Huttig, AR November 11, 1914. As head of Arkansas NAACP, leader of Little Rock desegregation, 1957.